There used to be no school on Thursday afternoon in France when I was a kid. Usually, we celebrated by having a dessert at lunch that was not just a fruit like the other days. Most popular were mousse au chocolat and iles flottantes. I don’t remember ramekins like in a restaurant, but can still see the nice big china bowl filled to the rim and will never forget fighting over “cleaning” all the bowls, cups, whisk, spoons required to make it. The chocolate was one “plaquette” and a half of Poulain’s dark for baking, (150 gr). Any good dark unsweetened chocolate is fine, but pick the best you can get as the taste of your mousse totally depends on it! So while you melt this chocolate into a smooth liquid, you can beat 3 egg whites, whip 1/2 cup cream, stir 3 tbsps sugar, 1/2 tsp instant coffee, the zest of a quarter of an orange and 1/2 tsp vanilla extract into two egg yolks. The sugar must be completely dissolved. This is four different things you can do at once if you have a troop of kid helpers, or in sequence if it is just you. In fact, if you don’t have help, do this in reverse order. So far, so good, but the next step is key for your mousse to become a true “mousse” , literally foam , and not a cream or custard. The chocolate is perfectly smooth, you let it cool down and stir it in with the egg yolk mix. When this is perfect, you add the whipped cream very gently with a whisk, again until it is perfectly smooth. Last is the action that will make or break the mousse. The beaten egg whites are incorporated most carefully with a fork rotated from bottom up. You should work slowly and with the greatest care not to flatten the egg whites. Good. As soon as the colour is uniform , fill small ramekins or glasses or cups and refrigerate overnight. 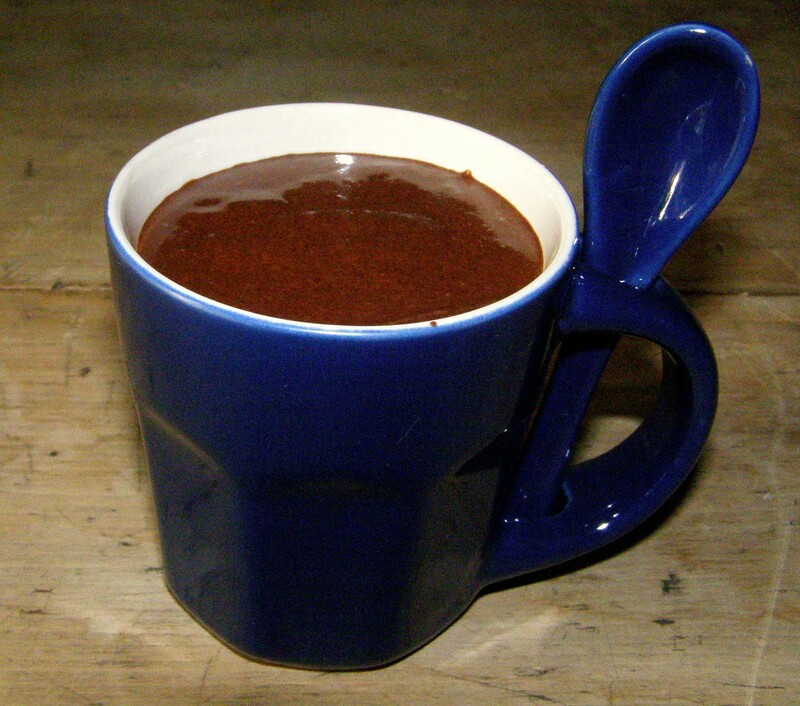 Today, I am serving the mousse au chocolat in expresso cups as it is part of a trio of desserts. I had enough for 8 small cups. Variants could include Grand Marnier or other liquors. Tip: Do not keep more than 36 hours. And…. that one egg yolk leftover is just what you need to start a mayonnaise to go with something at dinner. This entry was posted in Dessert and tagged chocolat, chocolate mousse, cooking, dessert, food, grand marnier, mousse au chocolat, poulain, recipe, recipes. Bookmark the permalink. It looks so yummy. I think my baby will love this. I wanna make this for his birthday. Tes, Let the little one do it! I remember having so much pride transforming egg whites and cream into solids. For some reason, we did not have an electric beater, so everyone had to take turns. and nowadays there is no danger with the range at all, the chocolate can be melted in the micro-wave on low or defrost. Just make sure, your help is also enrolled in doing dishes as I always seem to get all my bowls dirty.